Posted: Thursday, June 11, 2015. 5:05 pm CST. Thursday, June 11th, 2015. BMG: The United Democratic Party (UDP) is preparing for a by-election to be called on July 8, 2015 in the division of Dangriga, following the resignation of its PUP area representative Ivan Ramos. The PUP has delayed its decision on whether to contest the by-election until it has assessed its situation on the ground in the Culture Capital. But the UDP have no such qualms – Petrocaribe spending has been visibly transforming municipalities including Dangriga. More importantly, according to party leader and Prime Minister Dean Barrow, they have a strong candidate – Frank ‘Pawpa’ Mena, the former radio personality who rose to become Mayor of Dangriga from 2006 to 2009. Mena replaced former representative Arturo Roches more than a year ago and Barrow told reporters this past Sunday that, “There’s no doubt in my mind that Frank ‘Pawpa’ Mena will win and will win handsomely. 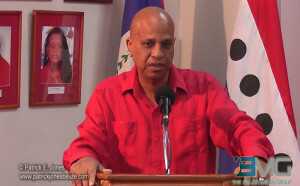 The PUP says that a team of senior members will go down to Dangriga to weigh the political matter in that constituency. Their recommendations will form the basis of their final decision in relation to the impending By-Election.